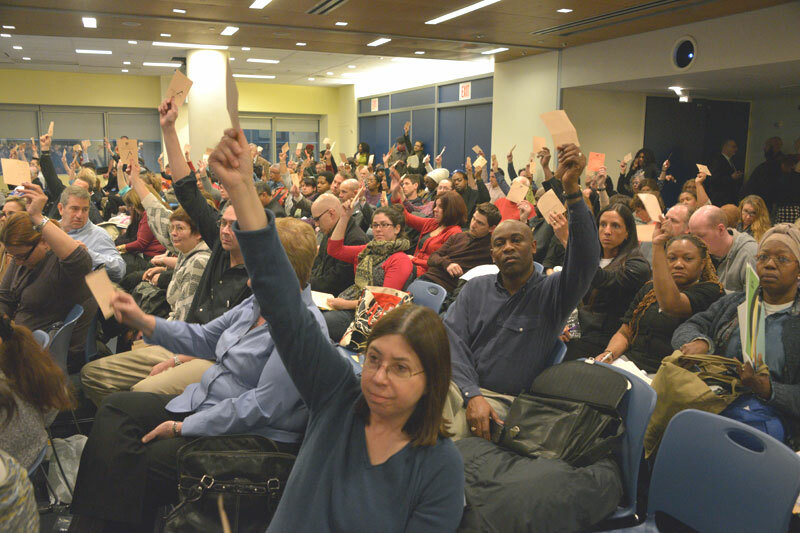 How many delegates dutifully raise their hands every month after getting the UFT’s cue? Should I go to the Delegate Assembly or the MORE protest? This was the question I asked myself yesterday afternoon while walking to 52 Broadway. Surely, the fervent MORE folks would be in front of UFT headquarters calling for a complete moratorium on the new evaluations. Inside UFT HQ, the Delegate Assembly would be voting on a moratorium of their own: no high-stakes testing until schools have the Common Core materials they need. There is not any doubt that the UFT designed this call for moratorium in response to MORE, whose online petition has collected thousands of signatures in less than a month. This is a victory of sorts for MORE, since it shows they can have some impact on UFT policy. Of course, the UFT moratorium is a completely declawed version of the MORE petition that accepts tying high-stakes, Common Core-aligned testing to teacher evaluations. Seeing as how it has been about two years since I have participated in a full-throated protest, and over 3 years since I have attended a Delegate Assembly, I opted for the latter. While I always feel guilty for missing DAs, my experience yesterday reminded me why I avoid them. I arrived at the reception hall just as the DA was about to start. The room was overflowing with delegates. The only remaining seats were towards the front to the left of the stage on which our president, Michael Mulgrew, would be standing. Many people sitting in this area were clearly MORE members, as indicated by their trademark red shirts. Our view of Mulgrew was blocked by camera equipment, as was his view of us. It is all the same, since he did not bother to look in our direction anyway. As Mulgrew started his opening remarks, I helped myself to a much needed power nap. There was only one available seat next to me, an aisle seat, which became occupied at some point during my siesta. It was an older man with a high-pitched voice who seemed to have something to say every 3 seconds to anyone around him who would listen. All the more reason, I thought, to continue with my nap. I promptly came to attention once the voting was set to begin. To introduce the moratorium vote one of Mulgrew’s trusted right hands, LeRoy Barr, gave an impassioned speech about the injustice of rating teachers on exams aligned to the Common Core when so many schools around the city have not received their Common Core materials. He reminded us that we all believe in fair evaluations and the Common Core. We just wanted to make sure that the new system was being implemented properly. However, other people raised their hands to speak on the evaluations in the proper Robert’s Rules of Order format. One dissident claimed that we are ignoring the affects of poverty on education and test scores. She then tried to introduce a measure to call for a complete moratorium on the teacher evaluations, at which point Mulgrew imperiously cut her off. In response, a young well-dressed woman explained that she went to a summer seminar on “results based” unionism and the union’s role in bringing us these evaluations were part of getting “results”. Meanwhile, the older gentleman next to me, who at that point noticed I was finally awake, turned to me and said the Common Core was great because kids who switch school districts in the middle of the year would be able to pick up from where they had left off. In an annoyed tone, I told him that the Common Core were standards, not a curriculum, and therefore guaranteed no such thing. I was tempted to add that local control of education has been a hallmark of American public schooling but I feared that thought would be lost on him. The comment of the night came from a MORE member who eloquently explained why these evaluations were a bad idea. He said he has been teaching for 13 years without incident and now, all of the sudden, the union is telling him that he needs Danielson and junk science “growth” scores. His mini-speech garnered quite a round of applause. Even my new friend next to me had to acknowledge he made some good points. I was hopeful that this speech had swayed some minds before voting started. However many minds it might have swayed, it was not nearly enough. The DA voted quite convincingly in favor of this moratorium, which was tantamount to recognizing the legitimacy of the new evaluations. Even the guy next to me voted in favor. It was at that point that I made audible reference to male bovine scatology. I turned to the sea of faces behind me and asked “are you serious?” My incredulity was returned with blank stares. I figured this would be a pretty good point to leave. It is clear that teachers do not want this system. It is also clear that the Unity Caucus that runs the UFT gets whatever it wants passed through the Delegate Assembly. They do this by controlling the flow of debate, apparently making up Robert’s Rules of Order as they see fit. More importantly, they do this by controlling delegates. The woman who mentioned “results based” unionism was obviously a very convinced Unity foot soldier. Doubtless there is a cushy job waiting for her someday at 52 Broadway. Then there are the delegates like my new friend who are half-informed and accept anything UFT leadership throws at them. These are by far the majority of delegates. They are not Unity sycophants. They are merely apathetic. Many of the people who clapped for the MORE member’s impassioned speech also voted for the moratorium. What these union members get from doing Mulgrew’s bidding is a bit of a mystery. My hunch is that, quite simply, they equate being a good union member with being a good soldier. Their attendance at the DA is a clue. Their passivity is another clue. As I asked them if they were serious, the blank looks I got in response spoke to a group of people quite satisfied with themselves and probably their self-images as union members. Yesterday brought home for me the importance of being able to organize school by school. Much like the Tea Party did with Republicans they deemed “moderate”, critical and active teachers need to run against these staid delegates in the schools. The Delegate Assembly needs to be reformed one delegate at a time. How that is done is the million-dollar question. This entry was posted in An Embattled Career, education reform, Politics, School and tagged education, School, UFT Delegate Assembly, UFT Testing Moratorium, Union Reform, Unionism, Unity Caucus UFT. Bookmark the permalink. Your post actually shows a bit of surprise. We have been so marginalized and our union has become nothing more than a welfare fund trustee that the DA is totally irrelevant. Yet some hold out hope that one day everyone will march out of there and start their own union. I’m waiting.